There are a ton of cheap batteries out there to choose from, so when we do reviews for them here at Android Police, we tend to be pretty picky. USB-C is a must-have from our mobile-first perspective, and anything less than 30W of output is a bit of a snooze. 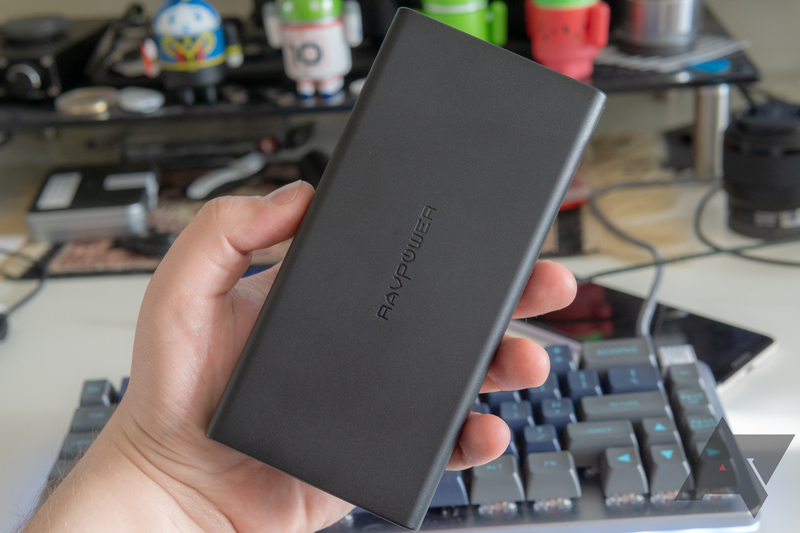 Thankfully, 45W seems to be the new high-end standard going into 2019, and RAVPower's new 20,100mAh battery ostensibly delivers that now-essential level of power for a mere $60. That's $140 less than what Mophie is charging for its similarly-spec'd 26,000mah battery, and Android Police readers can even get an extra $9 off via our exclusive coupon. Sadly, in our testing, it had a lot of problems. Price $60 (or $51 for AP readers for a limited time) isn't bad, given the power and capacity. 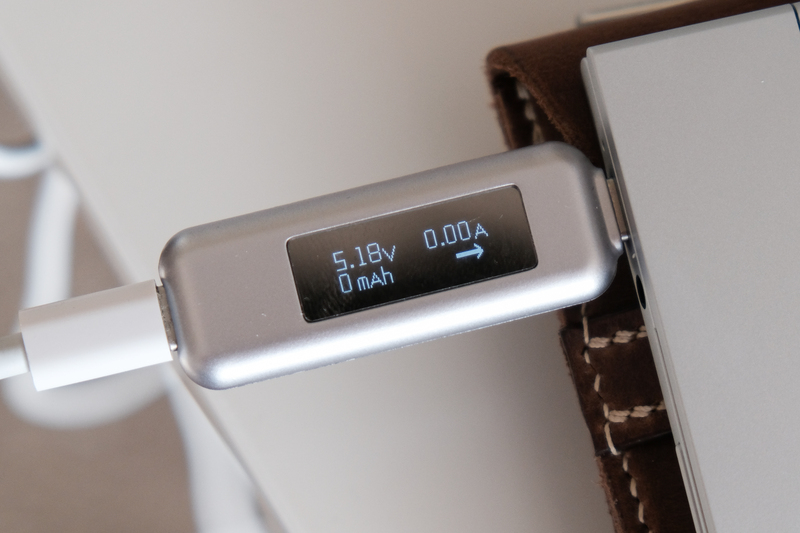 Rated output 45W is enough to power a laptop, making this battery useful for a much wider range of devices. PPS support is also pretty sweet. Design Ports all on one side, as they should be. Matte plastic is boring but durable. Design, again It doesn't feel or look very premium if you care about that. Compatibility It's a common theme with these high-output batteries, but it refused to charge quite a lot of devices in our testing. Other behavior was also wildly inconsistent. It's a battery, so it's a brick — them's the rules, I didn't make 'em. 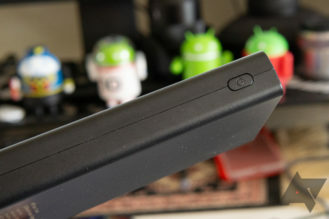 The battery is about the size of a modern flagship phone, though substantially thicker, and made out of black, matte plastic: boring, durable, safe. All the ports are on the top edge. 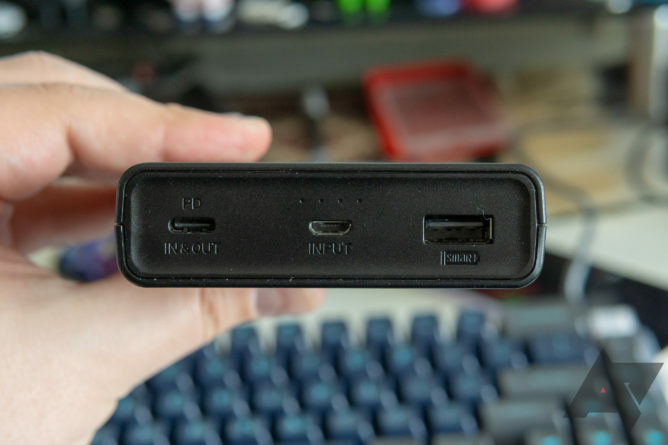 On that slightly recessed side, you get one combo input/output USB Type-C port, a Micro-USB port for use with older cables and chargers, and a single USB Type-A output, each labeled. Above the Micro-USB port is the seemingly ubiquitous 4-led charge indicator, activated by pressing a power button on the left side. 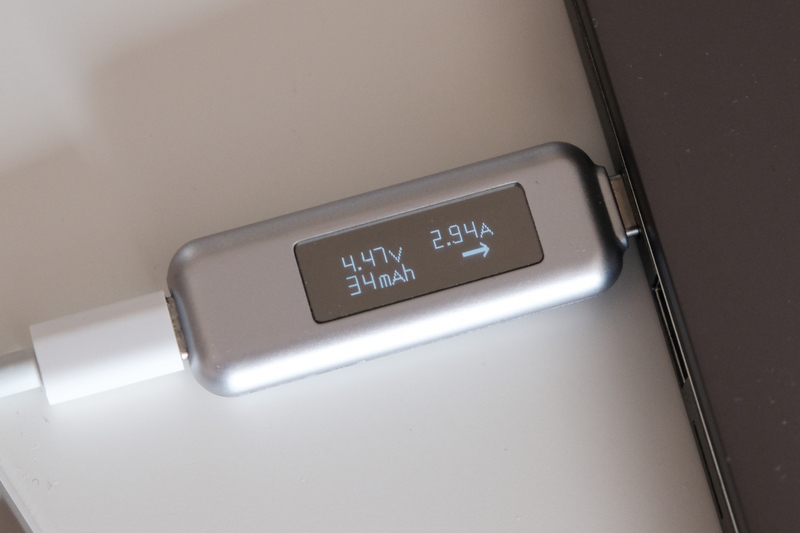 Hold that power button for ~5 seconds, and you can flip the battery over into a dedicated output mode if you're having trouble with the direction of charge via USB Type-C (indicated by a brief flash of the LEDs). 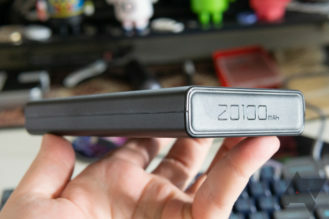 The remaining sides are adorned with logos (front), labels and regulatory information (back), and the capacity (bottom). Included with the battery are two cables — USB Type-A to Micro-USB and USB Type-C to USB Type-C — as well as a faux suede storage bag. The USB-A port is rated for up to 2.4A. As usually happens, I wasn't able to approach that amperage with any of my phones, but my tester had no problem hitting it. Of course, it's the USB Type-C performance we're most interested in. 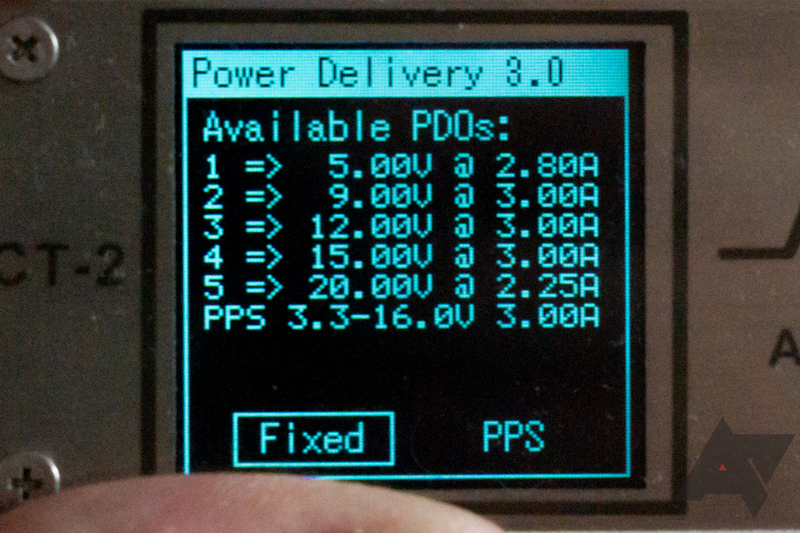 According to a new tester (which I'm still learning how to use), RAVPower's battery supports 5V, 9V, 12V, 15V, and 20V output, plus PPS (programmable power delivery) as per PD 3.0 spec in 3.3-16V. On paper, that all sounds great, but I still ran into quite a lot of device-specific wonk. Output varied drastically by device, and some wouldn't charge at all. RAVPower's battery outright refused to charge my Pixelbook, a notoriously picky device. Other Chromebooks had better luck, but numbers were all across the board; it wouldn't charge any I had at the full 45W, and most couldn't pull power at all. Although I could pull at/near the max output on my MacBook Pro, it didn't always work, occasionally even swapping roles when plugged in to drain my laptop's battery. Once in a while, it would also make strange high-pitched noises during use. When fully charged, my MacBook Pro couldn't reliably pull power from it either, randomly switching sources between internal battery power and the RAVPower battery. This is all pretty disappointing, but sadly, not too unusual. Much more expensive batteries have similar problems, even if they seem a bit worse in this case. It should also be noted, I had to test two of these batteries, as the first one I received refused to charge my MacBook Pro at all. Occasionally, even the replacement battery would just refuse to spit power, but unplugging and re-plugging in whatever cable I was using typically fixed it. 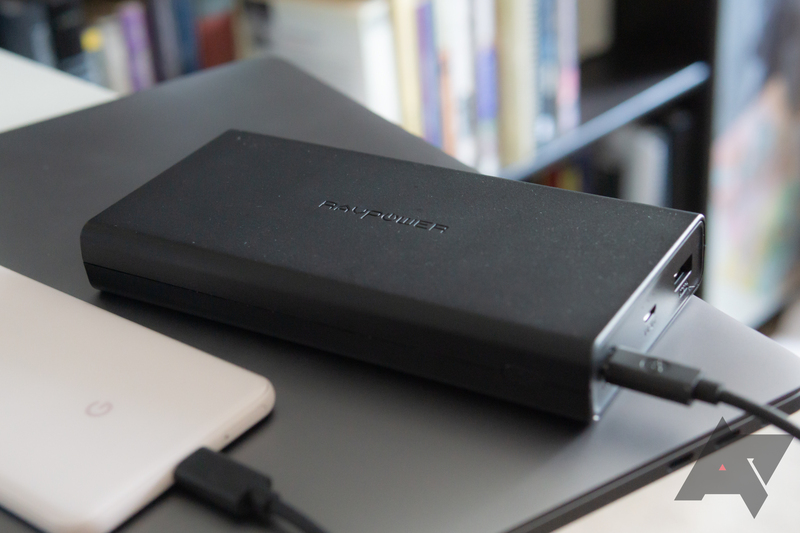 The battery supports pass-through charging over USB-A while plugged in via USB-C. RAVPower's battery also charges at 30W over USB-C, which is pretty good, but Mophie's Powerstation USB-C 3XL can slurp down 45W — at a much higher cost, though. Having both Micro-USB and USB Type-C available for charging could also come in handy, though I'd like to see two Type-C ports for more convenient pass-through if one can be used for charging. Maybe. 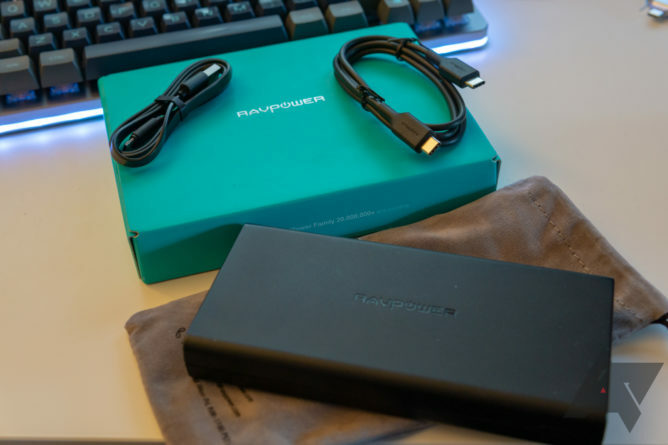 I've yet to use a "power bank" (a term I hate) which I can unreservedly recommend; there are just too many use cases, and each has its own compromises. Device compatibility seems to remain a crapshoot, and advertised numbers end up being unreliable as a result. I wouldn't buy this battery if you intended to use it with a MacBook Pro or one of the pickier Chromebooks. At 45W peak output, it can theoretically deliver a lot of power. Unless you're doing a lot of compiling or rendering on the go, it should be able to keep most Type-C powered laptops going — though power delivered to high-wattage devices in my testing was inconsistent. Still, for the $60 asking price the specs look good — at least, if you're willing to take the gamble that it might work with your laptop. If you are, we've got a limited time coupon good for the next nine days (ending 2/10) that'll snag you an extra $9 off, bringing it down to just $51. 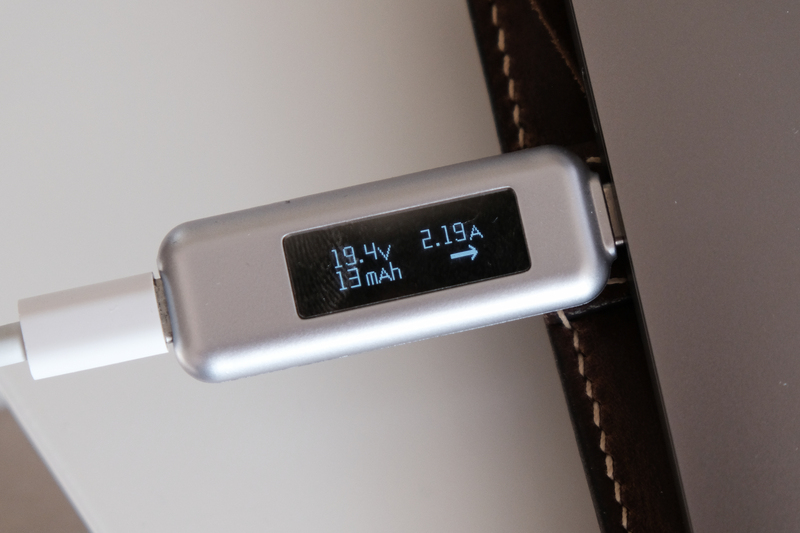 You'll be charging higher-wattage devices like laptops. You're on a bit of a budget. You're willing to gamble that it might not work with your hardware. 20,100mAh isn't enough for what you need. You need more output ports. You need a battery that can charge itself faster than 30W. You don't want to deal with a return if it doesn't work. Amazon - use our code ZR2O5D4Z for $9 off — expires 2/10.